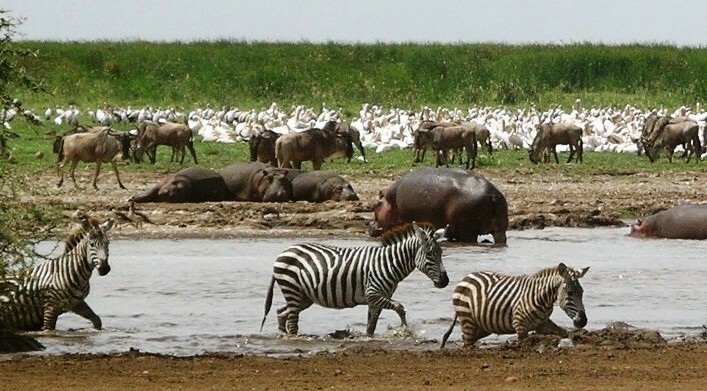 Depart Arusha in the morning for Lake Manyara, arrive by lunch time. Afternoon game drive. Dinner and overnight at campsite. After early breakfast depart for Ngorongoro crater, arriving in time for lunch. Afternoon game drive on the floor of the crater. Dinner and overnight at campsite. Ngorongoro’s caldera shelters the most beautiful wildlife haven on earth. The rich pasture and permanent water of the Crater floor supports a resident population of some 20,000 to 25,000 large mammals. They are not confined by the Crater walls, and can leave freely; they stay because conditions are favourable. Since most of the Crater floor is grassland, grazing animals predominate: gnu, zebra, gazelles, buffalo, eland and kongoni (Coke’s hartebeest) and warthogs. The swamp and forest provide additional resources for hippos, some of Tanzania’s last remaining black rhinos, giant-tusked elephants, waterbucks, reedbucks and bushbucks, baboons and vervets. The steep inner slopes provide a habitat for dikdiks and the rare mountain reedbuck. Towering euphorbias cling to the crater walls and on the floor, Fever tree and Fig tree forests give shade to an awe-inspiring array of creatures. All these animals in turn support large predators such as Lion and Leopard, and scavengers such as Hyena and Jackals. For the best viewing and photography, approach the animals slowly and quietly and stay on the official tracks. After breakfast drive to Tarangire. Afternoon game drive in search of wildlife, meals and overnight at our campsite. After breakfast enjoy a morning walking Safari just at the park border, then depart for Arusha.